Not suprisingly, Sainsbury’s felt obliged to apologise to the customer saying that it was not company policy to refuse service to people on mobile phones, and gave Ms Clarke vouchers to compensate for her treatment. But social media sites and internet forums were enraged that the store had caved in, and the public appeared to be rallying round the checkout worker. One could say a great deal about this incident, and its irony, but what struck me was the checkout assistant being hailed as a heroine. 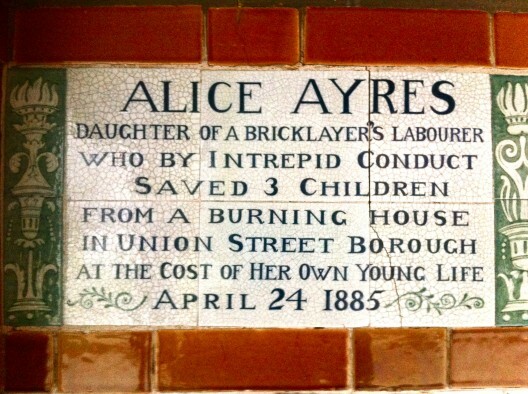 Tablet erected in memory of Alice Ayres in the Memorial to Heroic Self Sacrifice in Postman’s Park, Little Britain, City of London. This is one of 54 memorial tablets erected on a covered wall in the park, as a record of ordinary people who died saving the lives of others and who might otherwise have been forgotten. A hero or heroine in Greek mythology and folklore, was originally a demigod, the son or daughter from one immortal and one mortal parent. Later, hero, or heroine, came to refer to characters who, in the face of danger and adversity or from a position of weakness, display courage and the will for self-sacrifice – that is, heroism – for some greater good of all humanity. This definition originally referred to martial courage or excellence, but extended to more general moral excellence. In a dictionary, the first definition is invariably one that defines hero as a person noted for feats of courage or nobility of purpose, especially one who has risked or sacrificed his or her life. But there are other definitions: someone who fights for a cause, someone who can be looked up to for their actions, a person noted for special achievement in a particular field, or who is idealized for possessing superior qualities in any field, or just someone who an individual admires or idolises very much. And of course the main character in a story, play, film, who is usually good, is often portrayed as a hero who, despite the odds being stacked against him or her, typically prevails in the end. Myself, I prefer the hero who is brave in the face of danger or adversity, who fights for a cause for the benefit of others, as opposed to someone who is successful in their field, or who has influence, wealth, or fame. In the latter case, musicians, singers, sports people, TV personalities, royalty, are often idolised by fans and commentators and described as heroes, as are some inventors, scientists, entrepreneurs, unorthodox business people, and populist politicians. But to me, none of these groups are being brave in the face of danger or standing up for a cause with little regard for the consequences.